Our orthodontist near Hamburg, NY, is seeing an increasing number of adults choosing to get orthodontic treatment, and with options like Invisalign, it’s easy to understand why. If you’ve been on the fence about getting braces as an adult, then you owe it to yourself to see what Invisalign is all about. Our orthodontist wants to share with you the benefits of getting Invisalign as an adult and how this orthodontic treatment can improve your quality of life and oral health. 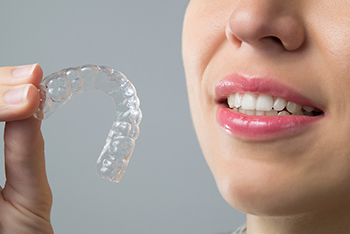 The thin, plastic aligners are transparent and fit snugly to your teeth, which makes them nearly invisible. You can straighten your teeth discreetly and comfortably, without your friends and family even noticing. Unlike traditional braces, there are no food restrictions with Invisalign. The aligners can simply be removed prior to eating and put back in once you’re finished. They also make it easier to thoroughly brush, floss, and use mouthwash after eating, which is recommended by our orthodontist near Hamburg, NY. Invisalign works faster than traditional braces. Most adult patients achieve results after only one year, but individual results will vary based on the severity of your case. Who Meets the Criteria for Invisalign? According to our orthodontist near Hamburg, NY, the ideal candidate for Invisalign has a mild overbite, crowded teeth, gaps between teeth, crossbite, or other bite irregularities. Those with severe dental issues may not be candidates for Invisalign and may require an alternate orthodontic treatment. Contact More Than a Smile Orthodontics to see if Invisalign can help you achieve a healthy, straight smile. This information is not meant as medical advice. It is provided solely for education. Our orthodontist near Hamburg, NY, would be pleased to discuss your unique circumstances and needs as they relate to these topics. Feel free to give us a call at 716.633.4747 or click here to schedule a complimentary exam and consultation with our 5-star-rated More Than A Smile orthodontist.